I’ve finally started getting excited about HIMSS. 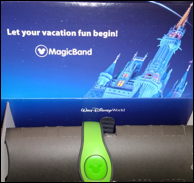 On Friday, my MagicBand arrived, personalized and ready for Disney to start transferring cash directly to their coffers. After learning hard lessons in the past about the need to book hotel rooms early, I was able to get a room at my hotel of choice. I planned to spend most of HIMSS with a good friend, but she tried to book a couple of days after me and wasn’t able to get a room. She does, however, have connections at Disney, where we were able to get significantly more posh accommodations for a fraction of what we would have paid at the official HIMSS hotels. Sure, we’ll have to deal with parking and traffic, but I’m looking forward to spending time with friends and getting away from the craziness of the show each night. I was also excited to get my HIStalkapalooza ticket. Even though I’m guaranteed an invitation, I do have to register for a ticket just like everyone else and it’s always exciting when that email arrives. Now I have to figure out what I’m going to wear and of course find the right shoes, so that will be on my to-do list for the next couple of weeks. It’s nice to have a project to work on that doesn’t involve federal regulations, frustrated healthcare organizations, burned out physicians, or medical practices struggling to survive. Things have also started to slow down at my clinical practice, with the near-epidemic of influenza finally easing up. Our fiscal year runs with the calendar year. Even though we monitor the numbers closely throughout the year, once we close the books, it triggers detailed accounting reviews and the beginning of discussions on our strategy for managed care and occupational health contracting negotiations. That dovetails with planning exercises and review of our recent growth and whether we should continue with our plans for opening new locations or whether we need to re-evaluate. Fortunately, our price transparency and the boom in high-deductible insurance plans continues to support our planned expansions. We have nearly triple the locations we had when I started, with several hundred employees. I had an opportunity to sit down with our chief operating officer this week. Part of the meeting was a review of my personal metrics. It’s nice to work at an organization that understands the role of metrics and how to use them drive organizational goals. It’s a bit if a luxury to be able to set our own metrics and not be stuck with what CMS and other governmental bodies think we should use, regardless of whether they impact our internal or community-based goals. We look at a variety of metrics that impact patient satisfaction, such as wait time, treatment time, appropriate referral for advanced imaging, procedural complications, survey results, and response to clinical follow-up outreach. Those metrics vary month to month, and in this cycle we saw a pretty significant impact due to the rate of influenza, norovirus, and other infectious diseases. At one point in December, we were seeing 50 percent more patients on a daily basis than we had ever seen, so it’s not surprising that patients would be a little less satisfied about wait times or congestion in the office. We also look at quite a few financial metrics, including charges per encounter and the distribution of E&M codes among providers. As you would expect, most of our visits fall under a subset of codes, but there are some outliers that occasionally over- or under-code, so we have to decide how to deal with them. Is it just a blip or part of a larger pattern? Does it increase our risk for audit? Is someone trying to game the system by getting their charges up without appropriate justification? We know that the cost of care at our facility is about one-eighth that of care at the area’s emergency departments, so it might be tempting for some providers to upcode. We also look at what the EHR suggested the code be, vs. what the provider or scribe actually clicked, vs. what the internal coders think. There is always some wiggle room depending on whether documentation elements were captured as free text or discrete elements, and our visits occasionally move up or down the E&M code spectrum after coding review. Not surprisingly, I tend to fall at the lower end of the pack as far as charges per encounter, which makes sense with my primary care roots and all of the managed care red tape I’ve had to deal with. I tend to be less free with prescriptions as well, which is understandable given the risks of polypharmacy with patients you don’t know well. It was interesting to see the comparative data and what some of my colleagues are doing though – I average 0.64 prescriptions per patient encounter, where some of my colleagues are in the 1.6 and 1.7 range. Most of our group is in the 0.85 range, so I’m not that far off the mark. Given the range, though, I recommended that next month we slice that data a little differently and look specifically at newer vs. established colleagues, moonlighting residents vs. midlevel providers vs. supervising physicians, full vs. part-time provider status, and distribution by location. We look at a lot of our data in aggregate, which makes it interesting when you know you have outlier data. Since we have our own in-house ultrasound and CT scanners, we look at the timeliness of referral for those modalities. Since I only work part time, any fluctuations in my practice patterns show up a bit more acutely than my peers who see many more patients each reporting period. My “timely referral for diagnostics” metric was significantly off from last month, and the COO got a kick out of the fact that I could recite the clinical situations of the patients whose visits drove the numbers. I had a flurry of cases that had to be transferred to the emergency department for higher acuity care (and in two cases had to go straight to the operating room) and let me tell you, those are the shifts you don’t forget. The urgent care keeps trying to lure me into a full-time role, and it’s getting more difficult to resist its call. We agreed to talk again in a few months. In the meantime, we’ll have to see if HIMSS brings any new and exciting opportunities to light my informatics fire. If you could have any job in the world, what would it be? Email me.